A variable, slender cormous plant with lance-shaped leaves and lax, sometimes branched, spikes of usually 3-8 funnel-shaped, cream, white or pink flowers, flaked with purple or yellow, in spring. To 60cm. [RHSE, CECB, Hortus]. ‘Flowers in May and June, earlier than G. cuspidatus. Scentless; blows freely, and is easily propagated either by seed or offsets. The spike being too large for our page, one rank of its flowers was necessarily omitted, leaving the spathes to shew the distich character of the inflorescence. Our drawing was taker at Messrs. Grimwood and Wykes's Kensington.’ [BM t.591/1802]. Introduced to Britain in 1774. [JD]. ABR pl.240/1802. Listed in the 1850 and 1857 catalogues [B.128/1850]. Gladiolus carneus was in Macarthur’s possession much earlier than 1850. 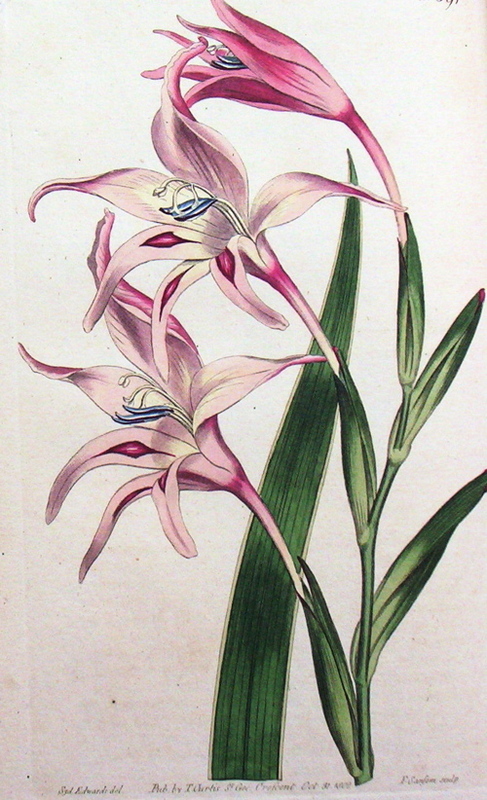 As Gladiolus blandus it was received per ‘Sovereign’ February 1831. [MP A2948-2]. In December 1844 he sent a large number of gladiolus bulbs and seeds to William Herbert, amongst which was one labelled ‘late flesh-coloured.’ Macarthur later added the word ‘carneus’ in pencil to his record. [MP A2948-3]. Gladiolus carneus Andr. (1802) = Gladiolus brevifolius Jacq. Common in the Cape, this has a lax spike of 4-12 rather small, sweetly-scented, pink and lilac flowers in spring. To 50cm. [CECB, Grey]. Introduced to Britain in 1802. [PD]. Probably not Macarthur’s plant. Gladiolus carneus Jacq = Gladiolus cuspidatus Jacq., synonym Gladiolus undulatus L. which see. Gladiolus carneus Herb.Banks ex Roem. & Schult. (1817) = Gladiolus hirsutus Jacq. which see. Gladiolus carneus Klatt (1864) = Gladiolus ecklonii Lem.